Gives you EVERYTHING you need to succeed with making money from Funnels in 6 to 12 months. Over 100 hours of training content covered on every aspect from Traffic, Funnel strategies, Writing Copy and more. Huge discounted package that bundles the best of Clickfunnels offerings together. Includes a ton of bonuses on top of what is being offered in each individual programs. VERY High investment costs! $1997 for a program is a really steep price. Membership page is spread out across many sites which could be a hassle! Information overload from too much learning and could cause overwhelm! What It Is: Funnel Builder Secrets is the successor to Funnel Hacks to being an all-in-one solution for funnels. It includes up to 12 months of Clickfunnels Enterprise ($297/month), 1 Year subscription of Funnel Scripts, and three training (Including Funnel hacks and the BRAND NEW Funnel Builder Secrets Training AND the Traffics Secrets Membership). This package was design to help you everything from writing copy, designing the funnel, and get you sales as soon as you launch your funnel. 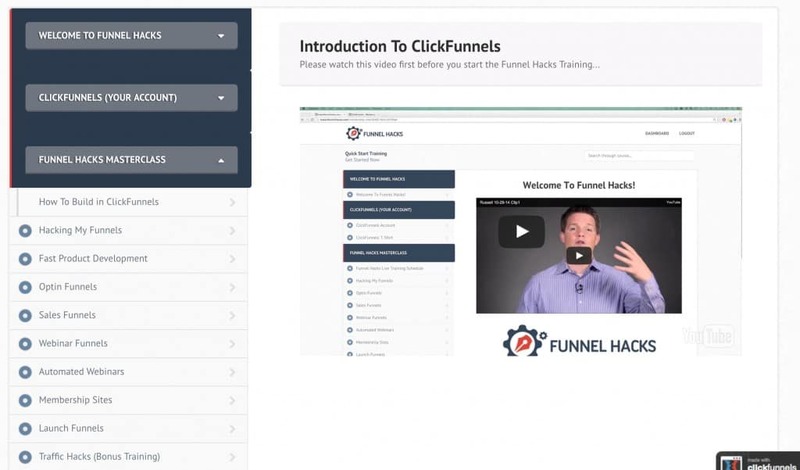 Pros: Everything you need to succeed in the world of Funnels using Clickfunnels is in this package alone, and you do not ever need to buy any other tool in order to build a successful Funnel. No further upsells! Cons: This is probably one of the biggest investment cost upfront for most people. While this is scary, Clickfunnels have a 30 days money back guarantee so there’s no risk involved in case you decide this isn’t for you. 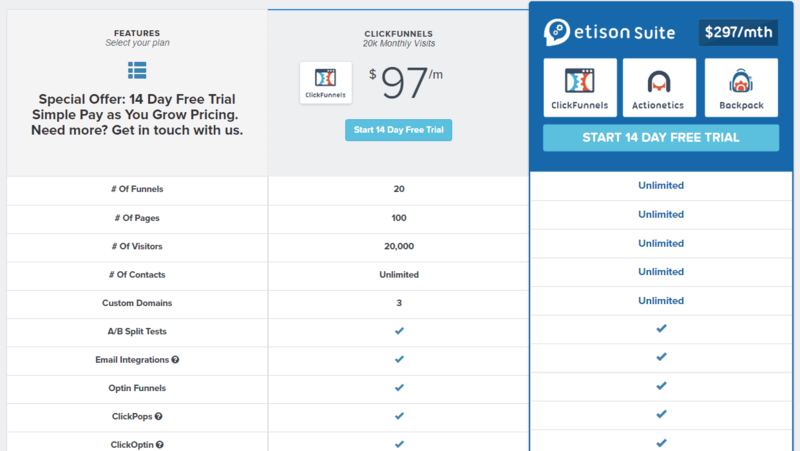 My Recommendations: If you’re already subscribed to the Etison Suite plan ($297/m), this plan can actually give you a discount for your subscription while you receive massive trainings and tools for free! If you’re planning to use Funnels for your business, look no further and get this package as there’s a lot of proven strategies that Russell shared in the training that can easily generate up to $100 for every $1 you put in! When I first signed up for the webinar, this page was shown. 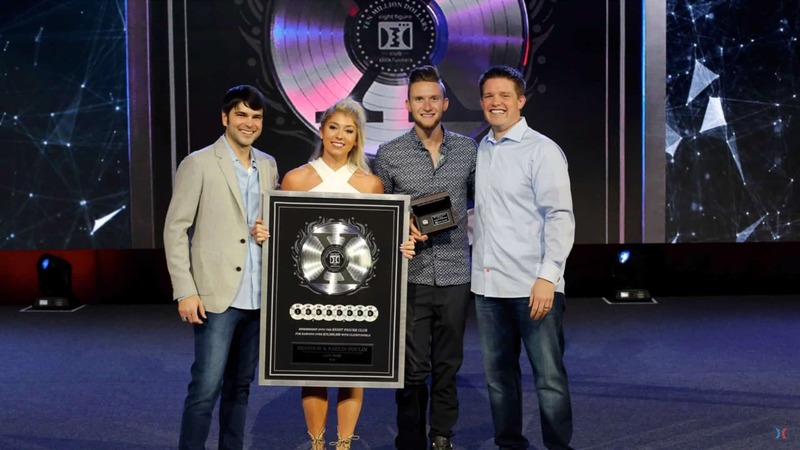 There’s three secrets that Russell shared in his webinar and the solution for each. But is it really possible to achieve these? I was curious enough to check out the webinar myself and signed up for it. By far, these are the most comprehensive package that Clickfunnels have to offer in order to build a successful funnel. Everything in this package is designed to help you be successful: From getting traffic, getting customers, selling to them and convert them to long term clients. My most recommended package would be to take up the $2,997 package for an entire year of Clickfunnels, as it’s just $1,000 more to get 6 more months of Clickfunnels at a discounted rate ($1,000 for 6 more months instead of $1,782). The training is delivered mostly by Russell Brunson, with the exception of a few courses such as the traffic membership where it is delivered by another person called John Reese who covers the Traffic part of the course. In the review below, I will be analyzing Funnel Builder Secrets and what you can expect to get out of it, while looking at its credibility as well. Let’s get started with this, shall we? You get access to the trainings PLUS access to Clickfunnels Etison Suite with includes Backpack and Actionetics too as well too. This is primarily the platform where you will be building all your funnels with the strategies and tactics that you learn from your the Funnel Hacks Masterclass, Funnel Builder Secrets training, and Traffic Secrets. One of the training which you will get access to, Funnel Hacks, will be given to you the moment you sign up for the training. The other trainings are similar to what you see below. All these membership websites are actually built with or on Clickfunnels so the company actually uses what it advertises as well too. How about the strategies and tactics covered in the program? You’ll get everything you need from Clickfunnels in all the different membership sites where they reveal every strategy and tactics used for their own business, and how to do the stuff that is shared on the webinar too. 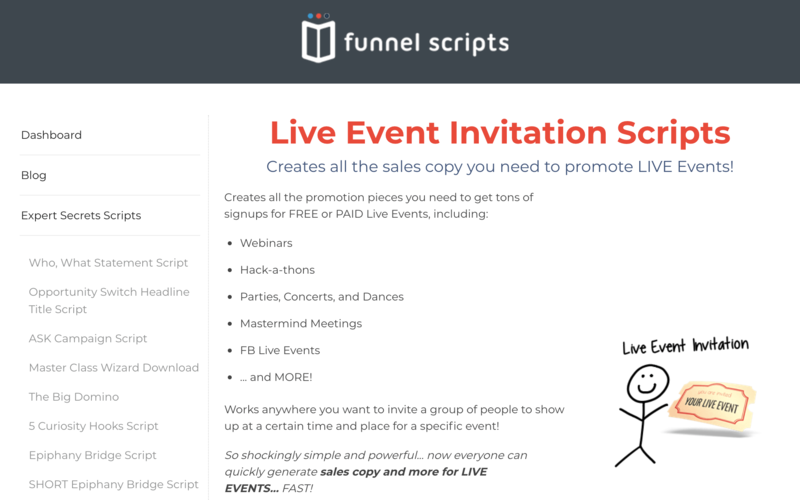 One other program you’ll get is Funnel Scripts as well, and this tool you write all your funnel copy, sales copy, facebook ads copies and even more! Besides website copy, it generates headlines for your ads and funnels too with over 100+ headlines that are proven to convert. All this is done by answering a few basic questions that takes less than 5 minutes. It even generate ideas for your funnels, ads, website content and ever more as it has options for those. PLUS, there are even some templates that write your follow up emails for you too! Literally EVERYTHING is written for you which are proven to work, and you don’t even need to ‘think’ of content any more. 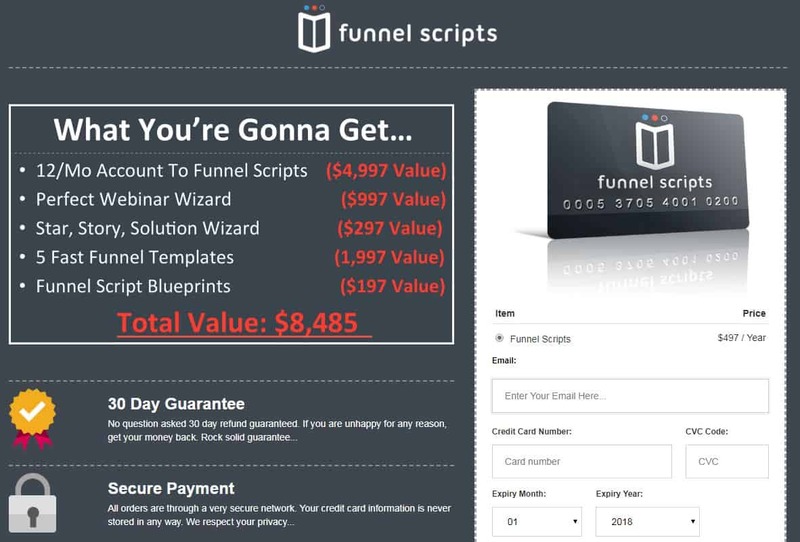 The coolest thing about Funnel Scripts is that whatever that is being taught to you (including many scripts included in the Expert Secrets Book) can be easily generated with this program by answering a few simple questions. All in all, you’re getting over 100 hours worth of training over 3 different types of trainings, including up to 12 months of access to 2 amazing softwares in order to help you get started with building funnels and succeeding with it. If you’re already an existing Clickfunnels member or Funnel Scripts member, then the membership will automatically be added onto whatever you have already. As a member of these programs and an avid fan of Clickfunnels, I can say that you’re getting your money worth if you choose to subscribe to Funnel Builder Secrets for sure! So Congratulations if you’ve invested, you shouldn’t be seeing any more upsells in the program! The only other thing is when your 6 months or 12 months of Clickfunnels Enterprise runs out, you’ll be paying $297/month to retain access. One other program is Funnel Scripts, where it comes in at $497/year after your your first year runs out. These are the only two things that you will need to be paying to maintain monthly and yearly subscriptions. The rest of your training provided with Funnel Builder Secrets is lifetime access. This means that even years into the future, you’ll be able to access all these trainings without additional payment. 3. 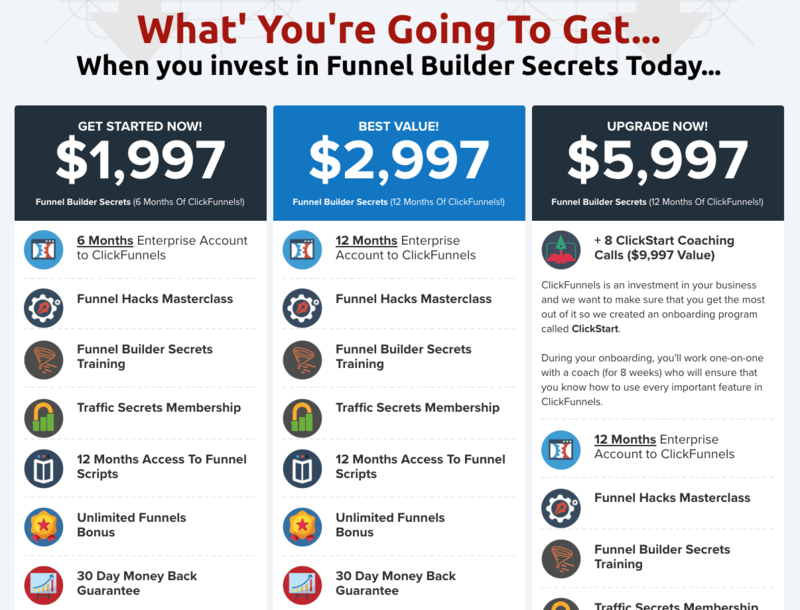 Does Funnel Builder Secrets Works For Beginners? What If I Have No Prior Experience? If you’re in business and just discovered Clickfunnels and funnel building, definitely aYES! 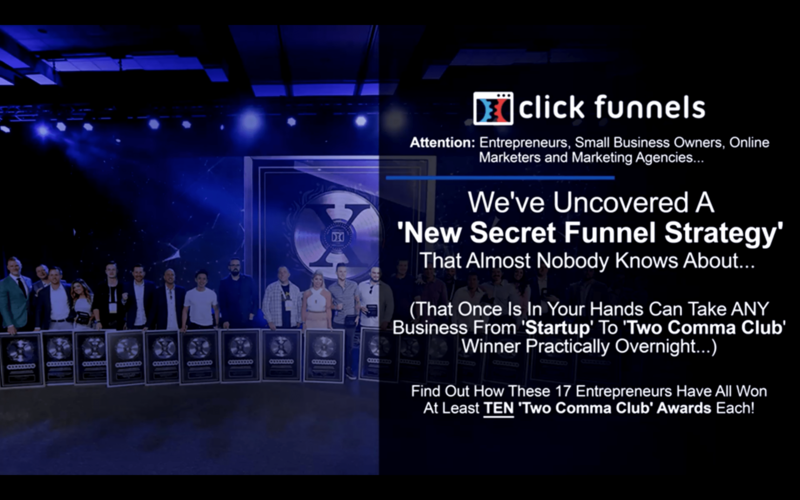 If you’re already a Clickfunnels member and don’t want to figure out, YES! This program is suited for people who are already selling a product or service or already have a business in place. If you are a total newbie and do not even know how to make money online, I would say to go for the Clickfunnels Affiliate Bootcamp which is more suited for you. The main point of this entire training is to integrate funnels into your business quickly, and to generate profits into your business as soon as possible. Hopefully even going anywhere from 2x to 10x your profits! All the strategies that are covered are designed for people who have no prior knowledge on anything however, so even as a newbie in digital marketing can pick up these skills fast too. 4. Who Is The Owner Of Funnel Builder Secrets? Funnel Builder Secrets is created and curated by the man himself, Russell Brunson and his company, Etison LLC. I did quite a few reviews on Russell’s credibility which you can find on my Clickfunnels, Clickfunnels Affiliate Bootcamp and Funnel Hacks article on him. 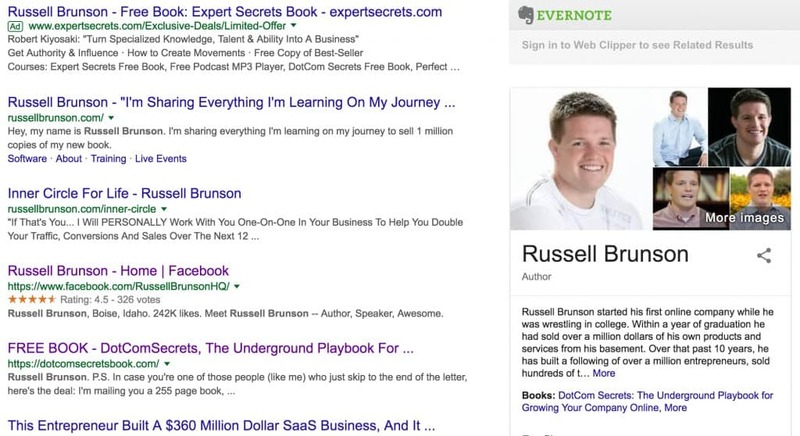 One fact that I pointed out in my other reviews is that the name Russell Brunson is very well known in the space of Funnels and Internet Marketing. A google search on his name shows everything that is related to him and his brand: Inner circle, personal website, Facebook page, his books (even on the ads), and even the news. He also appeared in many seminars as a guest speaker. 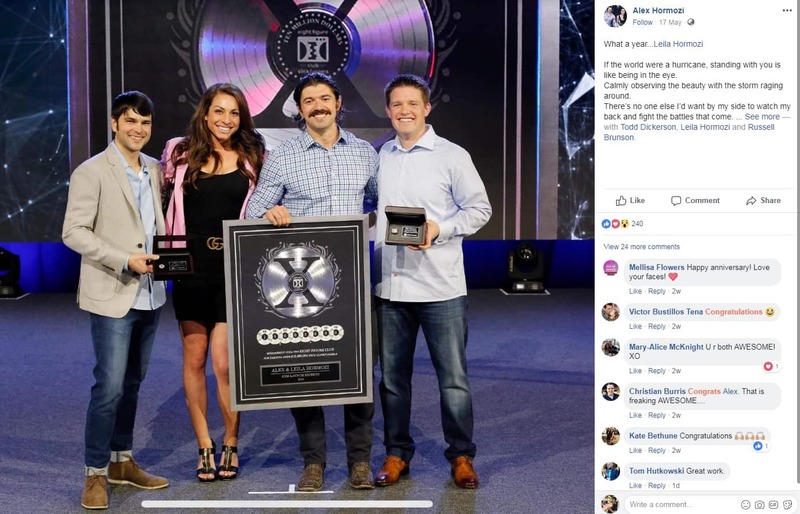 One example was Grant Cadorne’s 10X event in 2018 where he made over $3m in just about an hour of selling on stage. 5. Can You Really Earn From Funnel Builder Secrets? Considering how many people hit the 2 comma club (making $1M from Funnels), this seems very possible as there are quit a lot of people already in it including some that earn >$10M. 6. 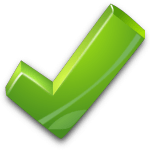 Are the Testimonials real? Throughout the webinar, there are multiple testimonials that were played. There were quite a lot of video testimonials as well compared to the Funnel Hacks webinar. 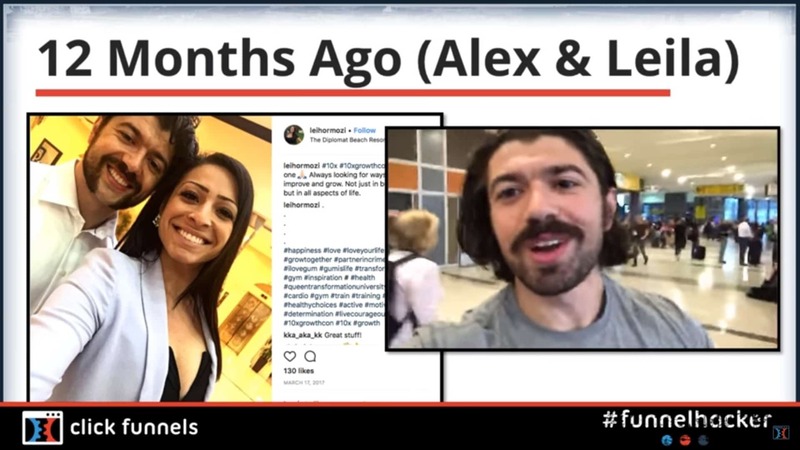 Alex was featured and the main thing he mentioned that he crossed the 8 figure mark during this short video and claimed that ‘You’re just one funnel away’. I did a quick research and found this on his Facebook page actually showing his achievement. They are also featured on the 2 comma club page. These two people are behind a brand known as Lady Boss, and they have also achieved the two comma club. Also through a video, Brandon mentioned how he and Kaelin spent their last dollars in their bank on Clickfunnels and wanted to take their passion online. It was literally the best investment they made, and also helped over 100,000 woman around the world through Clickfunnels. Same with any other programs by Russell and Clickfunnels, there’s a 30 days money back guarantee in case you don’t like the program and want to request for a full refund. Having helped a few people I know to cancel their Clickfunnels accounts, I know the process is as simple as a few clicks of the button. 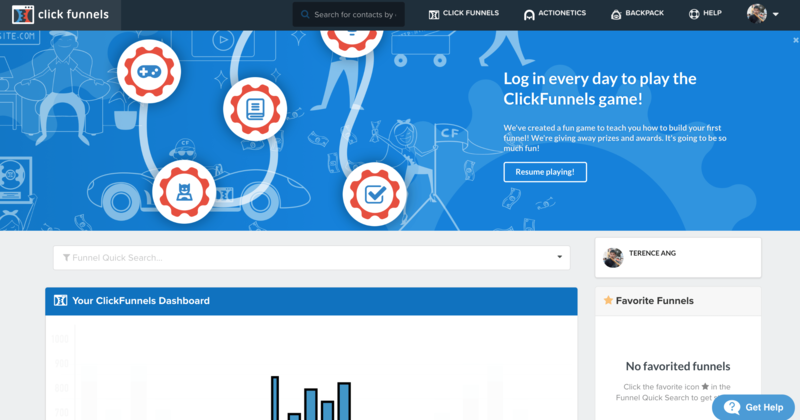 However for a refund for Funnel Builder secrets, you’ll need to contact the customer support on the Clickfunnels website. 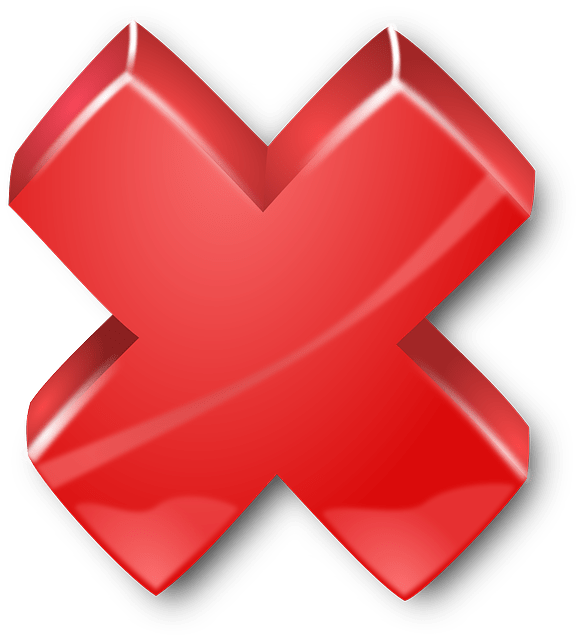 They have quite a big credibility so they uphold their 30 days refund guarantee quite strongly too, so you can be sure that you are secured with this guarantee and can ask for your money back any time during this period. If you already have a business, this is a definitely MUST GET if you want to grow your business! Originally when I wrote the Funnel Hacks article, I was pretty much going ‘This is REALLY expensive.’ Well, apparently this trumps the previous one in terms of pricing alone! One big thing that I found when purchasing such a large ticket item is to find out what is the value you’re about to get out of it. $1,997 could be a scary number to buy anything. But if I told you that you could make $10,000 within the next month after implementing the strategies in this program, would you do it? Going through this review as well too, I have probably mentioned the two comma club multiple times. These people went through the same process and probably paid way more (Over $10,000) for the information you’ll get in this program. If you feel like you’re not ready for this program yet, why not give Clickfunnels a try instead for a free 14 day trial to see if it’ll help you make a better decision? So what do you think about Funnel Builder Secrets? Do you think it can help you make 7 figures like the examples shown here? are included in Funnel Builder Secrets? Yes they’re all included! Funnel Hacks come with all of those, so they’ll be all together when you buy Funnel Builder Secrets.